And she cried out with a loud voice, and said: Blessed art thou among women, and blessed is the fruit of thy womb. And whence is this to me, that the mother of my Lord should come to me? For behold as soon as the voice of thy salutation sounded in my ears, the infant in my womb leaped for joy. And blessed art thou that hast believed, because those things shall be accomplished that were spoken to thee by the Lord. 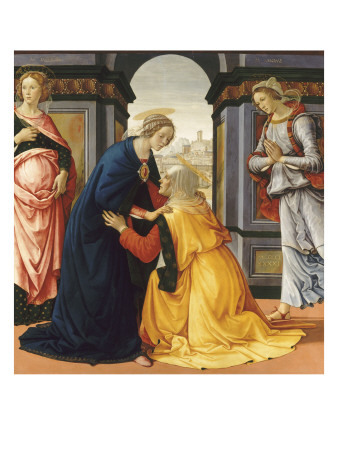 See how the Holy Spirit greets the Virgin Mary through the mouth of Elizabeth: "Blessed art thou among women and blessed is the fruit of thy womb! And blessed art thou that hast believed, because those things shall be accomplished that were spoke to thee by the Lord." Blessed indeed, for by this faith in the word of God the Virgin Mary became the Mother of Christ. What finite creature has ever received honor such as this from the Infinite Being? Mary gives all the glory to the Lord for the marvelous things which are accomplished in her. From the moment of the Incarnation the Virgin Mother sings in her heart a canticle full of love and gratitude. "My soul magnifies the Lord and my spirit rejoices in God my Savior, Because He has regarded the lowliness of His handmaid... Because He Who is mighty has done great things for me And holy is His name."